If you’ve never heard about ILA massage treatments, you’re in for a treat. It gets its name from the ILA Spa skincare brand, a creator of organic products that have become an industry favorite among luxury spas worldwide. ILA, however, is more than a quirky brand name. It is a Sanskrit word meaning “Earth”, which symbolizes a belief in nature’s power to bring true health and wellness. To live up to its name, the brand insists on handcrafting their products using organic materials such as Argan oil, which you’ll only find in Morocco. With that said, there are many benefits to trying the ILA treatment, especially if you’re considering a Marrakech massage and spa experience. Not only is it intensely relaxing, but it is also incredibly healing for the body and mind. ILA treatments, like many other forms of hands-on regimens, reaches deep into the tissue, reversing the damaging effects of modern life. It does so in combination with essential oils, scrubs, crystals, and other natural products to elevate your sense of well-being. Skin radiance & rejuvenation – The crystals and oils used by ILA practitioners can effectively improve the radiance of your skin and minimize the appearance of cellulite or aging. Reduces inflammation – ILA massage has the power to reduce inflammation, a problem that’s too common in modern society by means of both natural oils and revitalizing technology (more on this later). Detoxification – The crystals and salts, in combination with the hands of a skilled ILA practitioner, helps the body to cleanse itself of harmful toxins that accumulate over time. This boosts immune function and promotes a positive mood. Improves muscle strength/reduces fatigue – Like many forms of massage therapy, ILA treatments improve circulation, which in turn energizes tired and achy bodies. Relieves stress & tension – The most sought-after benefit of massage therapy, stress and tension relief occur with just one ILA treatment due to its detoxifying and muscle-relaxing power. ILA treatments come in more than one form. Like many Marrakech massages and treatments, ILA procedures come in different options with each one offering unique healing benefits. They address many of the most common complaints, meaning that relief and wellness are possible for anyone, regardless of their age, background or concerns. Hammam – These ILA treatments, offered as Vital Energy or Glowing Radiance options, combine a traditional spa experience that detoxifies, hydrates and nourishes the body. This is an ideal option if you want to restore a natural glow to your skin. Signature Ritual – With a focus on detoxification, the Signature ILA Ritual restores a sense of full-body wellness in the form of increased energy and an uplifted mood. This treatment is also great for those of us that are focused on maintaining soft and glowing skin. Facials – The ILA facials offered at Farnatchi Spa include Ananda face therapy (to stimulate skin cells and reduce inflammation), a revitalizing therapy for men (to counteract the effects of frequent shaving) and an age restoration therapy (to counteract age-related collagen loss). Massages – We offer two main ILA-based massages including a vitality massage (for low energy & circulation) and a Ku Nye full body massage (for dry skin, fatigue reduction). Scrubs – With our ILA scrub treatments, a practitioner uses the healing power of Himalayan salt crystals, which exfoliate and detoxify the skin and body. There are two available options – an energizing & detoxifying body scrub that cleanses and tones the skin, and a body renewal scrub that works directly with the sensory organs and adds a glow to the skin. Both options will give you an elevated sense of wellbeing. Express treatments – These short yet powerful treatments serve as versions of other procedures listed above. For example, our Express Bliss Face therapy is a condensed version of our Ananda face therapy and is ideal for dehydrated skin. Our Back and Shoulder Recovery treatment is a condensed version of the Body Renewal treatment that improves circulation, detoxification, and mood. Finally, our Instantly Blissful Scrub combines elements of the Body Renewal treatment and a “Scalp and Head Reviver” treatment so as to reduce head and neck tension while nourishing hair follicles. Marrakech is a city of adventure, but also, a city of rejuvenation and healing. Much of the city’s culture is steeped in promoting wellness, which can be seen with its longstanding infatuation with Hammams, a staple in Moroccan tradition. ILA is a modern take on traditional Moroccan healing, but it still uses many of the techniques that have reduced pain, fatigue, and anxiety for centuries. 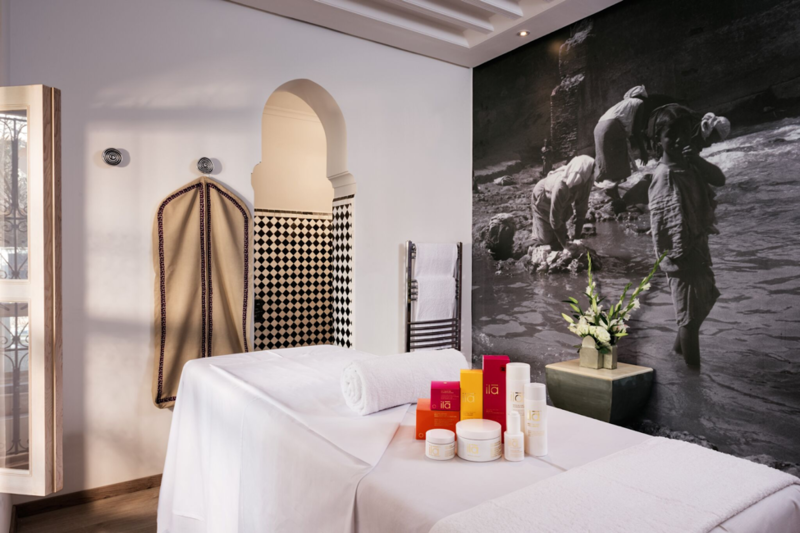 If you’re planning to visit Marrakech, do your body and mind a favour by undergoing an ILA treatment. You’ll no doubt return home feeling calmer and more energized than ever before!